Photo Courtesy of : Save Our Setters, Inc. Originally bred in Scotland in the 1600s the Gordon Setter has always been a popular breed with hunters. It was originally known as the Black and Tan Setter, but then with the interest of Duke Alexander the 4th the name changed to Gordon after the castle that he maintained his hunting dogs at. The Duke set out to improve the breed and encouraged others to do the same. Another important person in the development and popularization of the breed was the Duke of Richmond that took up the promotion of the breed after Duke Alexander's death. In the early 1900's the breed went back to the original Black and Tan name, but then was officially recognized as the Gordon Setter by the English Kennel Club. 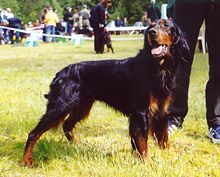 The Gordon Setter was also one of the first breeds to be recognized by the American Kennel Club. The Gordon Setter was brought to the United States in 1842 and was recognized as a breed in 1892. The Gordon Setter was bred as a one man hunting dog, not for speed but for a patterned and logical approach to finding game birds. It has been used as a pointer, for flushing out birds as well as for retrieving. This multi-level skill development has lead this breed to be one of the most intelligent of the setter breeds and a true asset to hunters. They have more recently become popular as a beautiful show dog as well as a faithful companion dog. •	Gordon Setters require 1-2 hrs. of daily exercise. •	Do well with children, even protective of the children. •	Can become destructive not receiving enough daily exercise. •	Do not fair well as a backyard dog. •	Gordons are independent and determined. •	Make excellent watchdogs and are wary of strangers. •	Can appear aloof to some but are loving toward their own family. •	Barking is not uncommon in the breed. •	Can suffer from separation anxiety and may become destructive when they do. •	Shedders and their coat requires more than minimal grooming. •	Although many Gordon Setters get along well with other animals, some may be aggressive toward other dogs. •	Not recommended for apartment living. Despite the long and somewhat silky coat the Gordon Setter is an amazingly easy to groom breed. They do required regular brushing two or three times a week to prevent tangles and mats from forming, especially in the longer furnishings on the legs, chest, underbelly and tail areas. The coat lies very close to the body and can be brushed in the direction of hair growth using a pin or stiff bristle or wire brush. The longer hair on the legs, tail and belly can be combed with a metal brush or with the wire or pin brush. Pay particular attention to the hair behind the legs where the movement between the legs and the body can cause tangles and mats. The hair between the toes should be trimmed flat to the edges of the feet to prevent debris from being trapped. The nails should be kept trimmed and flat to the surface of the ground without pushing up on the ends of the toes. The ears should be checked for any debris or waxy build up and should be cleaned accordingly. As with all hunting breeds the coat of the Gordon Setter is naturally water-resistant and has a natural oil that protects the hair and keeps in free from dirt. In the case of the Gordon Setter it also provides a beautiful sheen to the coat. Only bathe when absolutely necessary and avoid using any human hair products on the breed that will dry out the natural oils and lead to a dry looking damaged coat. The Gordon Setter requires regular, intense exercise to keep focused and calm when in the house or during periods of inactivity. They are a large breed that has historically been used for long periods of hunting and tracking and needs to be moving about more than sitting still. The Gordon Setter will do very well with one or two long walks a day provided they have a yard or fenced area to explore. The breed tends to do poorly in kennels or small confined spaces as they need to stretch their long legs in romps and runs. Since the Gordon Setter is very tolerant and non-aggressive with other dogs they make excellent candidates for exercising in dog parks and off leash areas. They are somewhat prone to getting on a scent and ignoring the owners calls so only allow the dog to exercise off leash when they are completely trained and responsive. Often when owners find that the Gordon Setter is becoming distracted, hyperactive or non-compliant it is directly related to not getting enough exercise. Always exercise this breed before they are left alone in the house or taken for a ride in a vehicle. They love to go with the family and are great dogs to travel with. The Gordon Setter will play with children for hours and makes a great hiking, camping and jogging companion. The Gordon Setter should be socialized and trained at a very early age as they are natural learners but can just as easily develop good as well as bad habits. They are not an aggressive dog but can be somewhat aloof and stubborn at times so they do need consistent, firm and gentle handling. As a hunting dog the Gordon Setter needs to feel that he or she is working with the family, not for the family. They love to be challenged and then praised and given attention, and usually all the correction that will be needed is to ignore the dog and give a simple "no" command. This breed does not respond well to punishment or even harsh tones of voice and overly harsh treatment will lead to a dog that will not respond to commands. The Gordon Setter should always be exercised prior to training as they tend to be a very energetic breed, especially as puppies and may have trouble focusing and attending when not properly exercised. They learn best when taught one command at a time without a lot of repetitions. Typically this breed will learn a basic command in one or two lessons and then has it mastered. Excessive repetition will simply lead to non-compliance. The Gordon Setter will need little training to track, scent, flush and retrieve game birds. Many puppies will naturally exhibit all these hunting behaviors and will just need to learn the commands that owners wish to use. These dogs are very methodical hunters and owners will often see them setting up patterns and moving across the yard with the typically zigzag pattern of hunting and scent breeds. Remember when training a scent dog you may need to keep them on the leash to prevent them from wandering off when they become focused on the scent trail. The Gordon Setter is considered a very healthy and hardy breeds and has no specific genetic or hereditary problems that are not seen in other large breeds of dogs. Within the breed Bloat, also known as Gastric torsion may be a problem, as can canine hip dysplasia. Both of these conditions can be treated and are not life threatening. elbow dysplasia and Progressive Retinal Atrophy are occasionally seen and a vet can provide information on these conditions. Cerebellar abiotrophy is very occasionally seen in the breed and is a neurological disorder with no known treatment or cure. Reputable breeders will not breed lines with a history of this condition.